The journey towards ‘balance’ seems to come up often as I work with leaders and young professionals. 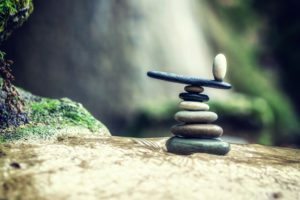 Early on, I always assumed balance meant that we gave parts of our lives equal attention, especially with the on-going, ambiguous, and somewhat unhelpful “work/life” balance discussion. Recently though, I’ve come to find that balance is more a state of mind, and it has to do with how you perceive and feel about the rhythm of your life, your work, and your service. Balance is an individualized pursuit and a science of one. So to that end, I thought I would offer a series exploring the eight areas identified by the ‘Wheel of Life’ (health, fun & recreation, personal growth, friends and family, physical space, money, career, and relationships), as I’ve had some new insights about this overall topic for leaders and individuals. For a few pieces, I invited guest writers to share their thoughts on these topics. As I spoke with others about this series, I unearthed again and again that not only is a conversation about balance integral to our success as leaders, but it’s also a process. We can’t just address this once and be done with it. These themes and insights, and the habits we form must be visited regularly, especially as we recognize that our life goes through stages and changes quite regularly. How your Wheel of Life looks right now, and how it is affecting your leadership and your organization likely looks different than it did a year ago. And it will likely look different a year from now. It is the continued wrestling with this process that will deepen our learning and inspire our journey. Check these reflections out so that you may come to your own conclusions and path forward toward the balance that matters to you.